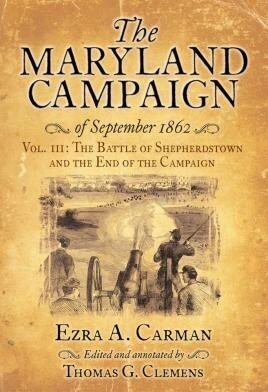 The Battle of Shepherdstown and the End of the Campaign is the third and final volume of Ezra Carman's magisterial The Maryland Campaign of September 1862. Unfortunately, due to sales rights restrictions, we cannot offer The Maryland Campaign of September 1862 for sale in your country. As bloody and horrific as the battle of Antietam was, historian Ezra Carman—who penned a 1,800page manuscript on the Maryland campaign—did not believe it was the decisive battle of the campaign. Generals Robert E. Lee and George B. McClellan intended to continue fighting after Sharpsburg, but the battle of Shepherdstown Ford (September 19 and 20) forced them to abandon their goals and end the campaign. Carman was one of the few who gave this smaller engagement its due importance, detailing the disaster that befell the 118th Pennsylvania Infantry and Maj. Gen. A. P. Hill's success in repulsing the Union advance, and the often overlooked foray of Jeb Stuart's cavalry to seize the Potomac River ford at Williamsport. Carman also added a statistical study of the casualties in the various battles of the entire Maryland Campaign, and covered Lincoln's decision to relieve McClellan of command on November 7. He also explored the relations between President Lincoln and General McClellan before and after the Maryland Campaign, which he appended to his original manuscript. The "before” section, a thorough examination of the controversy about McClellan's role in the aftermath of Second Manassas campaign, will surprise some and discomfort others, and includes an interesting narrative about McClellan's reluctance to commit General Franklin's corps to aid Maj. Gen. John Pope's army at Manassas. Carman concludes with an executive summary of the entire campaign. The Maryland Campaign of September 1862, Vol. III: The Battle of Shepherdstown and the End of the Campaign, concludes the most comprehensive and detailed account of the campaign ever produced. Jammed with firsthand accounts, personal anecdotes, detailed footnotes, maps, and photos, this longawaited study will be appreciated as Civil War history at its finest.